Overall comment: Juicy & flavourful pork burgers! I feel that portion is slightly smaller than Fatboy's, but taste is still good. All the tables, benches, lighting, & piping are done by the guys themselves! From burger buns, to the patties, to the sauces! They also take pride in using Sea Salt & only "real mayonnaise", not the commercial Lady's Choice kinda mayonnaise. (I've been eating LOADS of 'fake' mayonnaise!) Quality & taste are their priorities. 1. When they came up with their initial idea, there were not many burger joints yet, but because the shop preparation took quite some time, loads of burger joints popped up! 2. The guys were in businesses where the menu is extensive (pasta, pizza, Western food...etc) & with an extensive menu, quality could be compromised. Thus, the focus is on good burgers - simple, satisfying, quality maintained! Open-concept kitchen & their faithful tools (on the left), which they used to build Burgertory! Ala carte burgers are priced from RM12.00/burger & you can opt for a set with an additional RM5.00, which will get you fries + free-flow soft drinks. You can also opt for the Burgertory Fry Combo for RM9.00, which consists of fries + onion rings + Mozarella cheese stick + free-flow soft drinks. For this month, you can get a free upsize of the Fry Combo Set! I don't think I got to try this burger, but I will surely want to try out their mushroom burgers! They also have it with pork patty. Oooooeeeeey, goooooeeeyyyy, cheeeeeeesssyyyyy....yums! I had this & the cheese was oozing from all sides of the burger! It's quite a messy burger to have, but if you're a cheese-lover, this is cheesilicious! This was GOOD...although the curry reminded me of some good curry puff! I guess it's because of the variety of texture, taste, & flavours. The curry is alike Japanese curry - not really spicy, but still tastes good :) As I love onion rings, eggs, pork & cheese, this is like the perfect combination for the PerutBesi! Very porkilicious! 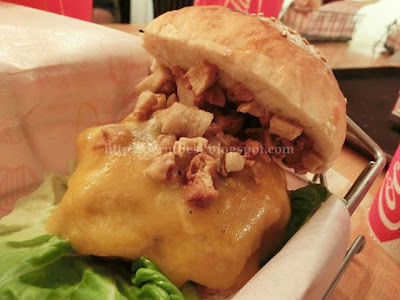 I had the "Bacon & Cheese Plus+", which is the double-patty version of this Swine Bacon & Cheese. The pork is nicely seasoned, although I felt that it's slightly heavy on the pepper, but oh, the bacon & cheese - something that I can't resist! I felt that this one looks quite common...I've yet to try it out. Thank you, sycookies for extending the invitation, thank you Jackson from Foodirector, & yes, thank you Burgertory for introducing us to this great pork burger place of yours! Business hours: Tuesdays - Sundays 6:00p.m. - 11:00p.m.